After assisting our clients with a pre-purchase consultation, this inner city home design was accompanied by a typical brief: The clients needed more living space and more natural light brought in to the double fronted period home. Our challenge was to renew the home within the challenging constraints of the site: a east-west orientation and homes abutting both south and north boundaries. Our response was to create an innovative energy neutral home renovation that maximises retention of the existing building. We’ve also made the most of the site by utilising the length of the block and extending the house along the southern boundary. Large double glazed bi-fold doors and timber windows open out the light and bright new addition to a sunny deck for indoor-outdoor living. 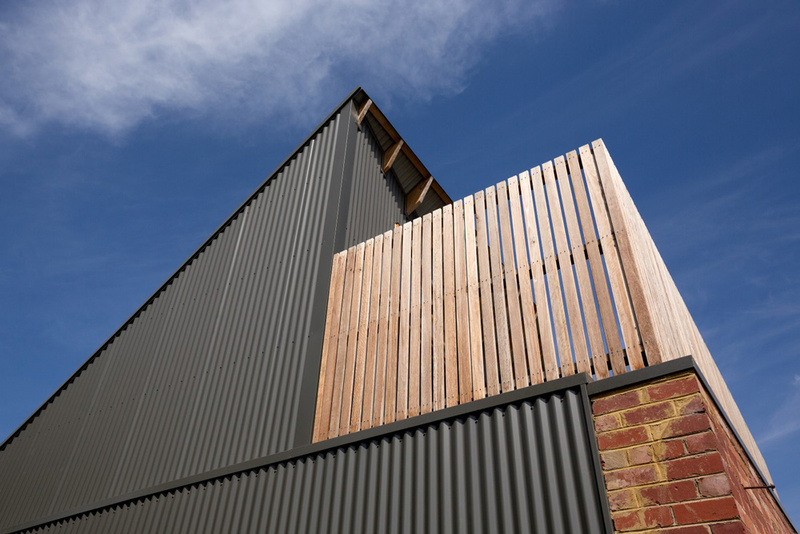 Low maintenance corrugated iron façade and no-fuss finishes such as polished concrete floors were specified throughout. The kitchen features contemporary and sleek black Formply, recycled brick, timber throughout, and hard-wearing stainless steel benchtops and splashback. The pantry is thermally isolated to ensure it maintains a cooler stable temperature, and the fridge cavity has an air duct transferring cool air from the garage to behind the fridge – anecdotally achieving a 20 per cent energy efficiency gain for the appliance. Alongside more light and space, the clients also wanted to improve the comfort, energy efficiency, and sustainability of their home. The home is now energy neutral with an extensive solar panel system providing surplus energy to offset service charges. Eighty per cent of the roof’s rainwater is stored in a 5000 litre water tank, plumbed to the laundry, bathroom and garden. The home also features a ceiling suspended laundry drying rack to reduce clutter and the need for a clothes dryer. 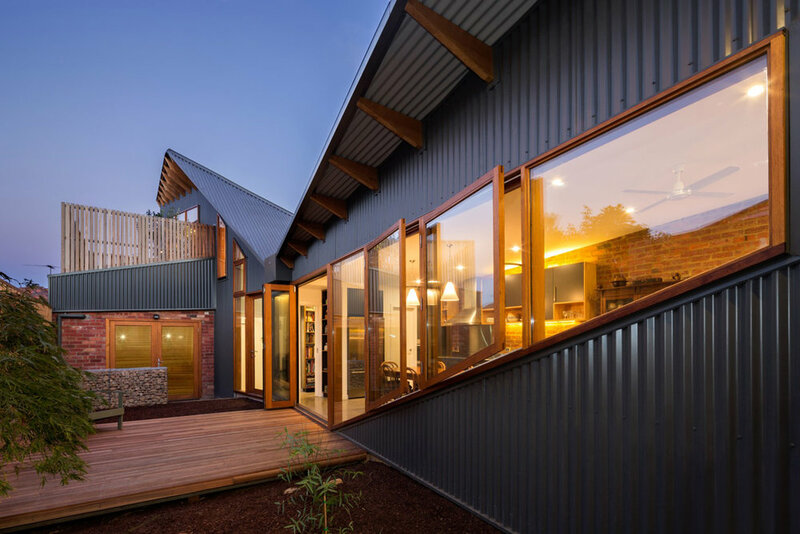 Winner, Best Environmentally Sustainable Design Award, Building Designers Association of Victoria, 2014. 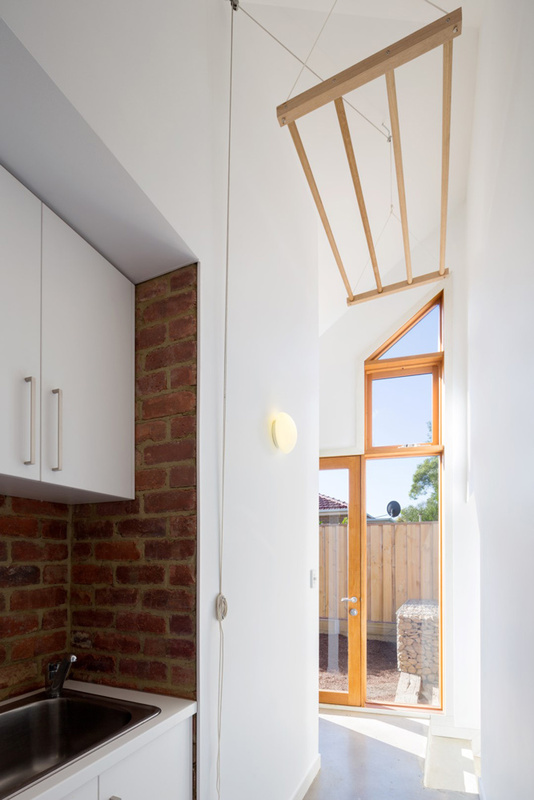 Winner, Best Alterations & Additions Award, Building Designers Association of Victoria, 2014.